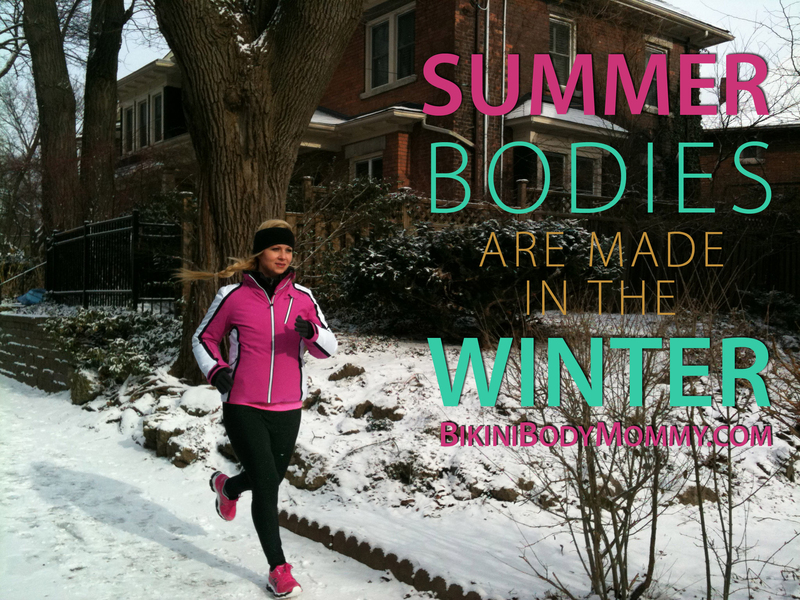 BIKINI BODY MOMMY™ — Summer Bodies Are Made In The Winter! Do you gain weight in the winter Bikini Body Mommies? It's a good question to ask yourselves right now because if you are anything like me -- the answer is yes! There are plenty of explanations for this seasonal anomaly... less activity due to colder weather, our layered winter clothing muffles awareness of creeping winter weight gain, less daylight results in loss of energy, cravings of specific comfort foods, and even depression! I know it’s hard to wrap your head around the thought of building your “Summer Bikini Body” when it’s only February, -20 and SNOWING outside... But you NEED TO! There are just over 3 months left between now and the first of June (A.K.A. BIKINI SEASON!) -- So IT’S TIME to REFOCUS our transformation efforts and turn things back around! SET GOALS ... Decide WHAT you want, WHEN you want it, and WHY! It’s been said a million times, but this truly IS the most important step behind anything you set out to achieve in life. This step is the KEY behind my own transformation and how I ultimately lost 100 POUNDS in under a year. Don’t just “think it” -- WRITE IT DOWN! Not only will you visually be able to see your goal, but you’ll also be able to come back to it in moments when your motivation and inspiration waivers. I want to lose ____ pounds, so that I can ROCK my absolute healthiest lean and toned BIKINI MOMMY BODY of my life this summer. Achieving this goal for myself is important to me because ___________________________________________________________________. Here are my TOP 5 NUTRITION TIPS from my Best selling book Bikini Body Mommy Blueprint to help you get started. Implement just ONE of these new nutrition habits for 1 FULL WEEK before implementing the next tip. REASON #2: The fish oil has plenty of data behind it that suggests that it has positive effects on the motivational centers of your brain (when taken in the dose I recommend), as well as increases FAT LOSS, and has an anti-inflammatory effect on the body. Why start here? It’s EASY — we can build up a positive momentum! And If we can actually make an impact the motivation centers in your brain to increase your motivation, in addition to fixing your nutrient deficiencies, increase your fat loss, and help you to be less sore from your new BIKINI BODY MOMMY CHALLENGE workout regime … you are going to have a better chance of success! #2 Eat Breakfast within 20 minutes of waking up (This means– BEFORE YOUR COFFEE!) Turn your metabolism into a fired up fat-burning furnace FIRST THING! Keep it small and protein rich. #3 Consume Protein-rich foods with EVERY MEAL Get at least 20 grams in per meal! Great sources include: eggs, greek yogurt, chicken, fish, bison, quinoa, black beans, lentils, and chickpeas. #4 BEWARE of WHITE This includes rice, pastas, potatoes, cereal, bread, fried food with breading, and milk. #5 Drink COPIOUS AMOUNTS of H2O AMOUNT: Consume at least half your body weight in ounces, upwards of 1 gallon every day — NO EXCEPTIONS! 1/2 your Body weight Example: 150lb woman would drink 75 ounces DAILY — a little over 6 traditional 12oz water bottles. 1 Gallon Example: 10 traditional 12oz water bottles DAILY. As I mentioned in the beginning of this post ... there are just over 90 Days between now and the beginning of summer. Luckily for you, I have 90 DAYS of workouts for you to follow for FREE. They are all “winter weather” and mommy “limited time” friendly as they are all done in the comfort of your own home and (excluding cardio days) most of them are under 12 minutes long! Newer PostWhere the Heck Have I Been? !